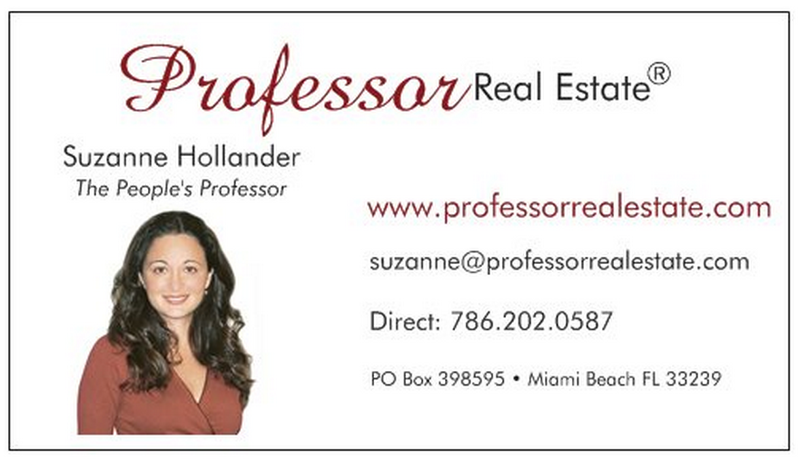 Click the photo to watch Professor Real Estate®TV featuring Miami Dade Property Appraiser Lazaro Solis & Suzanne Hollander teaching you how to $ave, apply for a Homestead Exemption! Read below to learn answers to six frequently asked questions about the Homestead Exemption! Check out your county’s property appraiser’s website for more info! (1) What is it? Homestead Exemption is a right extended to property owners in Florida, that reduces a property’s taxable value by up to $50,000 on a taxpayer’s primary residence. (2) How do I get it? Apply by March 1! It’s renewed automatically, but you have to get your paperwork into yr county’s property appraiser by March 1. (3) What’s So Great About the Homestead Exemption? So Great #1: Up to $50,000 reduction off your assessed value, which reduces your taxable value. S0 Great #2: Save Our Homes Cap Limits How Much Your Taxes Increase. Once you qualify for a Homestead Exemption, each year any assessed value increase is limited by 3% or the increase in CPI whichever is less, even if market values rises above that limit. The Cap = B.I.G. $aving because Florida property market values often rise higher than the cap. So Great #3: Protection from Creditors. Your home is protected from the reach of creditors, except for liens for taxes and your primary lender. So Great #4: Portability. If you sell your home, you can pack-up (“port”) to $500,000 of the difference between your assessed value and the market value of your old home, and bring those savings to your new home. (4) Its So Great! love it! How Many Can I get? You can only get one. A married couple may only claim one homestead. (5) Can Snowbirds get it? Nope! Snow birds may enjoy our Florida sunshine, but not this Florida benefit. The Homestead exemption is for people who own a primary residence is in Florida. (6) I own my home and rent it out, can I keep the homestead exemption? No! If found out you could be fined and penalized. This will be expensive. Don’t do it! If only a portion of the property is rented, you may still be able to receive a percentage of the exemption, but you must check with the Property Appraiser. To learn more about how to save $$$ property taxes and other smart ways to save on real estate contact Professor Real Estate®! Contact Professor Real Estate® for empowering real estate consulting, education! Watch Professor Real Estate® TV for real estate lessons you can apply now!